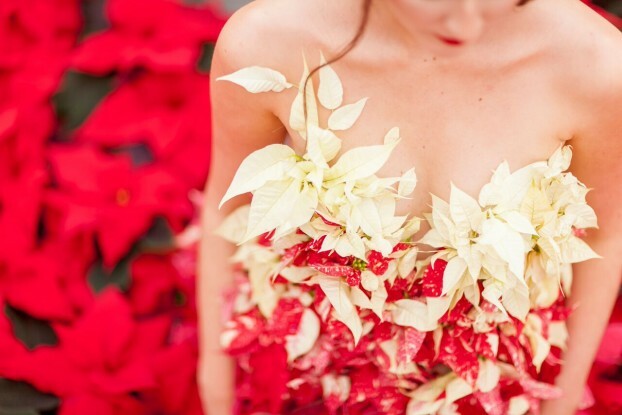 Even if you can’t fashion your own poinsettia dress for a holiday gala, the good news is that you can cut poinsettias and use them in floral arrangements. If you’re ambivalent about the traditional Christmas poinsettia, then I’m excited to help change your mind. 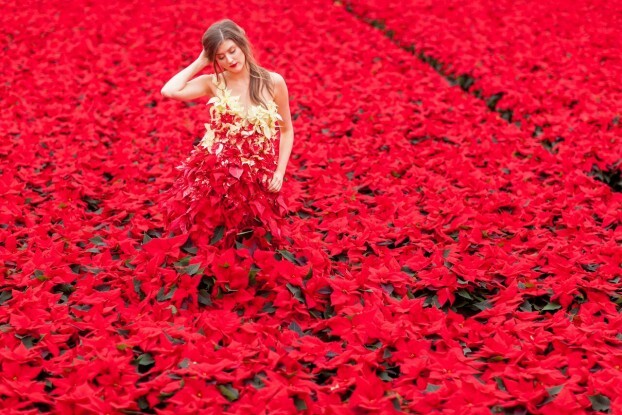 Check out this gorgous “living” poinsettia gown. Yes, the prosaic holiday potted hostess gift has received haute couture treatment by London-based floral stylists, Okishima & Simmonds, in celebration of International Poinsettia Day, which is tomorrow, December 12th. I learned of this holiday from horticulture publicist Liz Anderson and it’s no surprise to learn that she’s also deeply involved in British Flowers Week (the inspiration for our own American Flowers Week). Hat’s off to Liz and to Chikae Okishima-Howland and Jessica Simmonds, the duo behind Okishima & Simmonds, for bringing a luxe look to the potted Christmas plant. The designers have posted a fabulous behind-the-scenes story of how they created the poinsettia dress, which you can read on their blog here. I met all three of these talented women when I attended the RHS Chelsea Flower Show earlier this year. They are doing some amazing things to promote British horticulture and floriculture — you can see another of their brilliant executions right here! And aren’t these images by the very talented Julian Winslow quite beautiful? Okishima & Simmonds re-imagined the Christmas classic by fashioning a dramatic ombré gown from over 300 freshly cut stems of red, variegated and cream poinsettia and styling it amongst sea of poinsettia plants. The sexiest poinsettias I’ve ever seen! 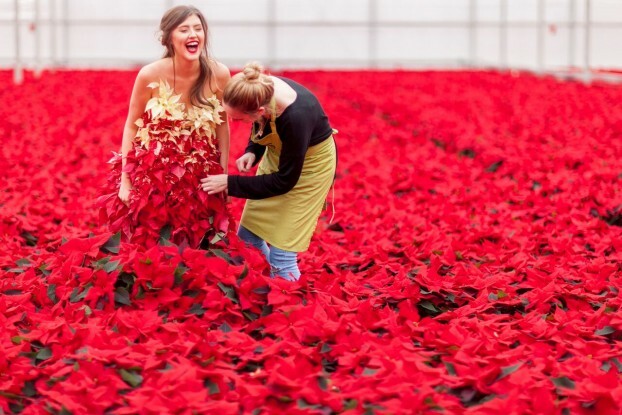 “We love to create unique designs that merge the floral world with the fashion world and International Poinsettia Day has given us an exciting opportunity to do that,” says Simmonds of Okishima & Simmonds, commissioned on the project by Stars for Europe, the EU-wide poinsettia campaign. Poinsettias are as much a Christmas classic as the Christmas tree itself, and are known as ‘Christmas Stars’ in much of the world. 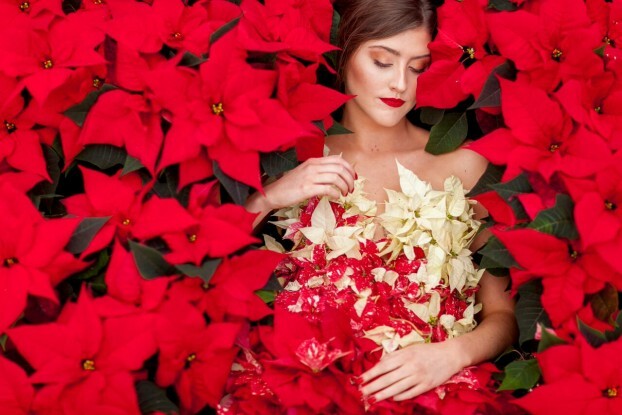 In 2014, over eight million poinsettia plants were sold in the UK in just two months, an increase of 15% on the previous year, making the poinsettia the best-selling houseplant after the year-round orchid. 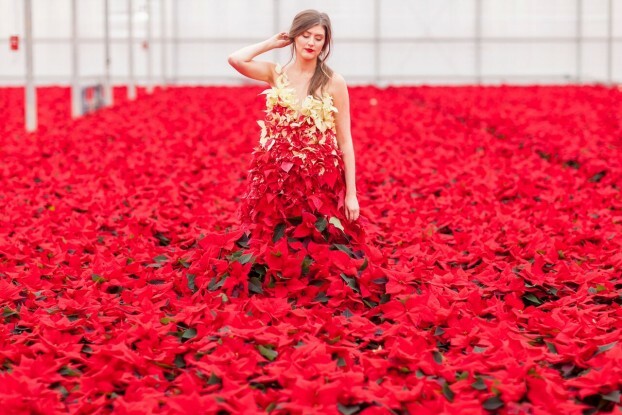 The poinsettia fashion shoot was set in the vast poinsettia glasshouse of Hill Brothers Nurseries in Chichester. After I received the gorgeous photos and Liz’s press material for International Poinsettia Day, I had more questions for her. And by the way, just in case you wondered: All the plants used are British grown – the red poinsettias were grown in Chichester and the smaller varieties were grown by Woodlark Nurseries near London. Liz also told me that the poinsettia were cut, then dipped into hot water 60˚C (140˚ F) for 20 seconds then into cold water for 10 seconds. This seals in the sap and makes the poinsettia last longer. 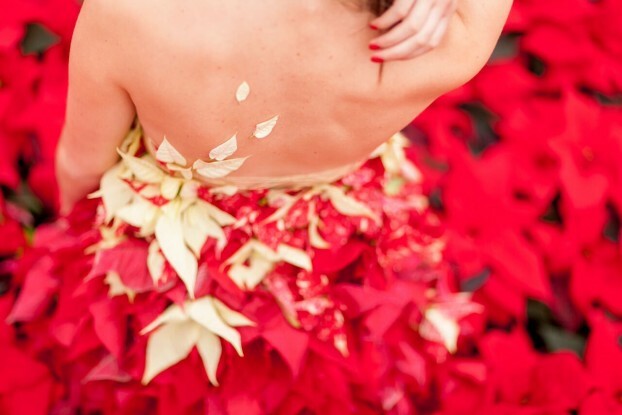 Even if you can’t fashion your own poinsettia dress for a holiday gala, the good news is that you can cut poinsettias and use them in floral arrangements. She’s just announced the design-with-poinsettia contest and the deadline is 12/24 to submit photos of your entry! Loree writes: Send your image to spiky plants at gmail dot com. The contest will close on Christmas Eve, I’ll post the entries during the week between Christmas and New Year’s Day. International Poinsettia Day is celebrated on December 12th and marks the death of Joel Robert Poinsett, the U.S. diplomat and botanist, who introduced the poinsettia to the United States from Mexico in 1828. Okishima & Simmonds is the partnership of fine art graduates and trained florists, Jessica Simmonds and Chikae Okishima. They use flowers to style weddings, events and fashion shoots from their London studio. The family-owned and managed Hill Brothers Nursery was founded in 1920 and, now based in Chichester, covers over 8 acres of ornamental pot plant production. Hills currently produce approximately 3 million plants a year – including half a million poinsettias – for the UK consumer and also directly supply UK supermarkets. This entry was posted on Friday, December 11th, 2015 at 9:13 am	and is filed under Blog Posts, Creativity, floral design, General, Plants, Playfulness. You can follow any responses to this entry through the RSS 2.0 feed. You can leave a response, or trackback from your own site.